Information on past fundraising events done by the TLT. Darragh and six of his friends set off on their bikes from their apartments in Shenzhen at 5:30am for the first train to Hong Kong at 6:30. They made their way through the crowds, drawing much attention sporting spandex padded bicycle shorts, and as they arrived on HK soil we realized we were one man down. 45 minutes later their fellow cyclist emerged from the interrogation room bemused by accusations of pro-Tibetan activism and questions about his “real reasons” for border crossing that Saturday….somehow the get-up and bicycle didn’t give it away. Needless to say they missed the first train and arrive in HK just before 8am where their chaperone for the day, Dan was waiting for them on his motorbike. Off they went on a route straight from Google earth, untested unknown they had no idea it was not flat! Temperatures started off kind as they cycled through the suburbs to their hilly destination. After 3 hours they were low in 30 degrees heat and rising with 90% humidity…it was getting difficult. They pushed on deep into the hills of the new territory and encountered a climb that defeated all but 3 out of 7 of them. The hills were so steep they travelled at a speed of 65km per hour coming down! Darragh assures us that the photo’s don’t do justice to the scenery, it was spectacular in places and worth the effort to get there. They cycled 7 hours and 120Km in total, it was a great day and they all felt great accomplishment uponcompletion. Later that evening they dragged themselves back to SZ and had a BBQ to raise some more cash, about 40 people came to support and over 600 euro was raised there. It was difficult to calculate exactly how much they raised as they all encouraged people to donate throught the website but they estimate the total to be between three and four thousand euro. Shenzhen Celts donated $500, and the Shenzhen Dragons donated €100. All in all it was a great day for a great cause and Darragh is extremely happy that he could chip in to the great work that is going on at home. We are all extremely proud of and grateful to Darragh for the time and effort that was put into this event. Cathal Beale, a close friend of Tracie Lawlor who tragically passed away in November 2007, was crushed when he could not partake in the cycle from Dublin to Wexford on April 5th this year but his disappointment soon turned to inspiration to organise a cycle in Kentucky where he is currently on a scholarship with Darley Flying Start. 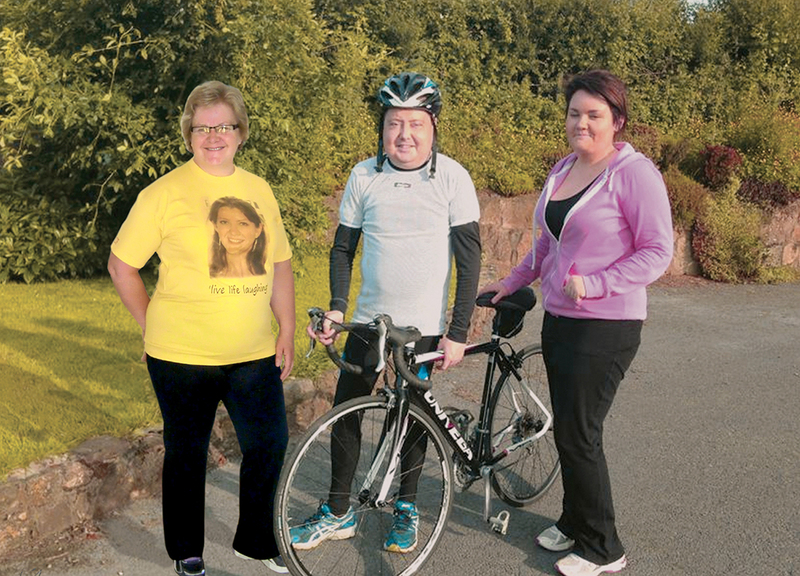 He convinced five of his new found friends to put together an event that would mirror the charity cycle in Ireland. On Sunday 27th April 2008, six young men began their six and a half hour journey from Churchill Downs to Keeneland to raise money and awareness for Cystic Fibrosis. They set off with months of training behind them to cycle the 125km route. The road was long and steep but the wind and rain kept their distance as the boys pedalled their way through the small towns and villages of Kentucky. They all finished the journey without too much struggle and in keeping with the spirit of the Irish cycle, they received medals on their return for their fantastic achievement which were sent over by Tracie’s parents. They were welcomed to their final stop to a well deserved barbeque feast and twenty to thirty people who applauded each one as they passed the finish line. The sponsorship raised together with the money raised from the charity tablequiz they organised on Wednesday 23rd April came to a total of over $1,500 which will be sent over to Wexford to be added to the €55,000 which was raised from the Irish cycle. Tracie’s parents Ian and Philomena Lawlor are eternally grateful for all the work that has been put into these events. A trust has now been set up called the Tracie Lawlor Trust for which many more events will take place to raise money in the future. If you would like to donate to this charity please click on the donate page. On Saturday 5th April 2008 about 130 cyclists set off from UCD in Dublin for a 140 km Charity Cycle to raise much needed funds and awareness for Cystic Fibrosis sufferers. The event was dedicated to the memory of the late Tracie Lawlor who passed away last November from Cystic Fibrosis. Tracie lived a full and vibrant life which was in no way defined by her illness. Those who were lucky enough to know her were inspired by her enduring spirit and irresistible charm. Tracie was the inspiration behind this event which we hope will make a significant difference in the hometown of our dear friend. A convoy of vans and cars led by Joe O’Brien coaches, who transported the cyclists, left The Porterhouse Castlebridge at 6.30am to meet up with those already in Dublin. After registration and a word of advice from Pat Geoghan the cyclists set off at 9.20. As the weather was fantastic and the wind was in their backs, they all set out to enjoy and relished the challenge ahead. The first of the riders reached Castlebridge at 1.30 and the last at 4.30, which was well ahead of the times set out by each rider. As each cyclist finished they were presented with a medal by Tracie’s mam Philomena to mark their achievement. Refreshments were provided in The Porterhouse and the Castlebridge Fife & Drum Band also entertained the crowd who had turned out to welcome the cyclists home. This was a very special and emotional occasion for the Lawlor family who were delighted with the event and one of the biggest cheers of the day was when Tracie’s brothers Brian and Joseph arrived home. Joseph who also suffers from Cystic Fibrosis and has spearheaded a campaign for better facilities nationally, was very pleased with his own performance. Joseph also won the Talbot Hotel/South East Radio Person of the Year for 2008. Organisers Ruairi Culleton and John Morrissey were delighted with the way the whole day went and would like to thank all those who helped in any way to make the day such a success, Joe O’Brien, Anthony Neville, Slaney Cycling Club, Wexford Wheelers, Motor Cycle Club, Order of Malta, Enniscorthy Lions Club, Alan Corcoran of SER, all the participants and a special thanks to Ian and Philomena Lawlor for all their help.